I got a tweet from my friend Tom, who is also an anchor here in Houston, about the Nest/Revolv problem that will present itself today. And although I don’t know someone in this exact situation, there is such familiarity with this situation. Even the players are the same for the most part. And why do I as a digital marketing company even have an opinion on a thermostat/home automation company? Fascinating topic really. For those of you that have heard me speak, one of our biggest hot buttons is warning :::cough::: I meant to say educating, students on the evils of using third party systems to run their websites. And although Revolv is not a web platform, the problem that results is the same. The nutshell issue is that Alphabet, you know them as Google, bought Nest in 2014 and they have made a BUSINESS decision and will effectively disable a product that consumers purchased with a promise of a lifetime subscription. I stress the business decision, because this is the fundamental problem I see. Companies start up a certain way, and then when they are sold, business decisions are made that may not reflect the original promise of the company. Often when I teach my SEO Digital Marketing classes here in Houston, I meet people who tell me how great SquareSpace, Shopify, WeeblyWixWeb (sic) are. They all want to tell me how easy they work. Or how they can drag and drop, and it’s all most cool. Millennial students are the most mesmerized by all of this. I always ask them that if Shopify decides tomorrow that they want to become a retail energy provider that sells electricity and get out of the e-commerce business, where would that leave your business? Most dismiss me. You know that would never happen. If only that weren’t the truth. Way back when, we all blogged on a third-party platform named Blogger. It was awesome, and then Google, now known as Alphabet (yes the same people that bought Nest) came in and purchased Blogger. We SEO types used it, and recommend it, and then one fateful March day we all got an email that said Blogger will no longer be allowed to post to websites using FTP and that all the posts on Blogger now belonged to Google. It was a business decision, and woe to us who didn’t fit into the new business model. We all basically lost or blogs and had to start fresh with a new up and coming software called WordPress. But at least we owned our own files and no one was claiming the content and ideas we produced. Google has bought many applications, including Urchin, which has become Google Analytics, which is slowly starting to have fees attached to it. And I guess the days of Urchin being the most awesome Stats program are long in the review mirror. They bought YouTube. In fact, the list is endless of web applications they have purchased. And as I type this, kudos to Mark Zuckerberg for refusing to sell them Facebook. But the take away is the end user must understand the impact of working and dealing with third parties, that may just make a business decision and put you out of business. Understand that the cloud just means your renting someone else’s idea, and depending on how integrated you make it, your business may become completely dependent on it. No business is immune to being sold, and as the tech industry goes, sold to Google, and they can make any BUSINESS decision they want. The next question I get is, well then what do we do? I have always recommended using WordPress. Yes, you have to maintain it, and yes, you have to learn it. But with a great web hosting company standing behind you that will help you (think ACTWD 😉 there is no reason why anyone should be using any third-party software solution that does not allow you to touch and know where your files live. If its in the cloud, some day someone may kick you off of it and your business becomes a casualty of a business decision. 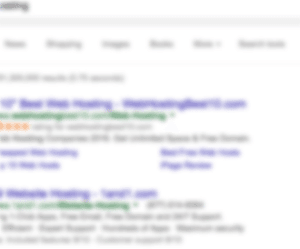 So one of my clients came to me and said that their site was being used as an example of how to knock our site o ut of the first slot on Google. Now we are ranked very well on a term that if I was to buy the word in a PPC campaign, the word is worth $188 a click through. The pressure on this word is tremendous, and it would not be ‘easy’ to knock it out of its #2 slot, as advertised. But some guy with a camera who can make a YouTube video and has a Link Network for sale decided he was going to explain how it could be done. When you’re not up on what is real and what isn’t, things can be very dangerous. So my client asked us to fix the stuff this guy recommended. The video makes it sound like if you don’t fix these things, that it would be easy to know the page out. Fix implies there is something wrong. And, it makes it sound as though with a few easy clicks of a mouse, the problem can be fixed. Now of course if you actually do what this guy recommends to insulate the page, it would dethrone that page, and maybe even the website. This is why when watching internet videos you have to have a basic understanding of what your watching so that your able to spot advice that may not actually work for your circumstance. So I have a page that is ranking, and the video’s first recommendation is adding words, so there was 1200 of them on the page. Funny thing is, the second I do that, I change the page, and I almost can guarantee it won’t rank. He also recommended changing H1 tags to H2 tags, again, doing something that would more thank likely HARM the page. Keep in mind its ranking #2 behind a HUGE directory that you will never dethrone. Now, if another page came along and did these things, would they out rank this page? Probably not, because the entire site is very powerful and it is laid out properly. Next thing he pointed out; the site was weak because it doesn’t have great links. And to that point he is correct, and if someone wanted to come along and put up a page that has better links, yes, its true they might beat our site. But doing it legitimately, is very very hard to do. I would agree that we could have a better link profile. When you already have normal links, you then need higher value properties, and that requires the client to take a more philanthropic roll in the community, as well as partner with larger entities in the community, and that just flat out costs money to do. Trust Flow was also brought up as a place where we are lacking, but didn’t analyze the fact that we have a lot of zero valued links, some of which are our own sites. And of course when you average a zero in it brings down a score, but there was no discussion of that. Additionally, at one point we had to disavow many links from a link network company, just like the blackhat SEO techniques that this video maker’s company runs. However, because there is no access to our WMT’s account, it can’t factor that in because it doesn’t have access to our disavow file. I have some of this going on with this site because our clients point to us, and many do it, but are simple brochure sites with non-monitizable anchor text. They are trying to be helpful and I appreciate that. So what was the solutions provided to dethrone our site? The overarching premise is correct; develop a site with a better link profile than ours. In other words, build a more powerful website. And that is 100% correct in its truest sense. Lastly, the video went on to list a myriad of ways for us to acquire links. If you were a rookie that really didn’t understand and thought you found a solution, or the motherlode of advice, and actually followed what was said, you would blow your site up…so here is how the video said to improve the link profile. Send articles to article directories and put articles out for syndication. As most of us know, this is not something you would do in the modern era. Your article should be so good that you will acquire links to it because you have said something people want to hear. In fact, take this post. I anticipate there to be some links formed to it over time. With another Penguin update rumored to be on the horizon and happening any day now, this would be a great way to get our website penalized. Specifically, he mentions going to PR Web and named them. Google is now wise to PR Web, and in fact its making issues. Yes it’s a cheaper alternative to the proper way to release a Press Release, but there is the rub. How are real releases released :)? Its not though PR Web. He advocated adding the site to directories that Google says are okay. Well, a directory that Google says is okay today, may not be okay tomorrow. We already have positions with real directories. Fake directories are becoming more and more frowned upon. Okay, maybe I should’t be so cynical to call the directory fake. How about this, lesser-known directories. Basically, yes, you need a site with good content, but not 1200 words, unless this is what you need to say what you have to say. (This blog post is @ 701 words). Create links naturally. Do not look for short cuts, gimmicks, buying links, joining syndicates, and so forth. Yes, I get that the private blog networks are now all the rage for developing links, but I can’t help but think that the Google police are not far behind on blowing the whole thing up, and on a site that is ranking as well as this one, you would NEVER EVER put the site in jeopardy of being banned for screwing around with links. Anyone that is going to show a spreadsheet of places to acquire links is pretty well suspect anyway. On a side note, I love my business partner. I asked him about this video and he said, “Yeah, well, we could change the H1 tag and I wouldn’t want to put the 1200 words on the page because the thing is ranking #2. Do we really want to monkey with the page? And yes, the guy is right that we need links. But, doing it though someone that sells links…?” The rest of the assessments, although we can always use links, and now we need really high-profile ones, the plan to dethrone our site is awesome, IF we actually were participants in it and helped blow it up. But an outside guy walking in and doing it with his site, ain’t never gonna happen. Be back soon with the “How do I get my post on Facebook to show up to more than two people?” answer.